Petite II - 13 Jet Whirlpool Bathroom Suite This great value Petite II bathroom suite is ideal for rooms that require a small WC, with a projection of just 610mm, it is the perfect stylish solution. The cistern is pre fitted with WRAS approved cistern fittings and a dedicated soft close seat which is detachable for easy cleaning. The whirlpool bath is fitted with 13 chrome mini jets with seperate on/off and air control to increase or decrease the power of the jets. Petite II - 8 Jet Whirlpool Bathroom Suite This great value Petite II bathroom suite is ideal for rooms that require a small WC, with a projection of just 610mm, it is the perfect stylish solution. The cistern is pre fitted with WRAS approved cistern fittings and a dedicated soft close seat which is detachable for easy cleaning. The whirlpool bath is fitted with 8 chrome mini jets with seperate on/off and air control to increase or decrease the power of the jets. 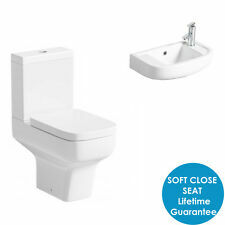 Included in the item: Wall Hung Basin, WC inc soft close seat. The M-Xpress Suite has been specifically created for those who require a compact solution without compromise due to its superior glaze and ceramic quality. • Ceramic wash basin and pedestal. • Pedestal wash basin. Basin & Pedestal. Morgan 4 Piece Set - Specification for quality of vitreous china sanitary appliances.